Place the oil in a cast iron or heavy skillet and heat. Add the mochi, reduce the flame to medium-low and cover. Cook 3 to 4 minutes. Flip over, cover and cook another 3 to 4 minutes or until the mochi puffs up. 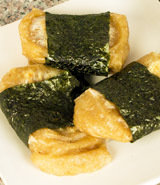 Remove from the pan and wrap the nori around the mochi. Mix the shoyu, water and ginger in a small dipping bowl. Dip the mochi in the dip sauce and eat while hot. This is a very popular sandwich in Japan and is served for breakfast, lunch, dinner or just a healthy between meal snack. Variation: Finely grated daikon radish or red radish can be used in place of ginger. The ginger, daikon or radish help aid in digestion of not only the oil but of the mochi as well. These are traditional accompaniments in Japan when mochi is served.